Katey Devine still gets goosebumps when you bring it up. The New Berlin West shortstop flawlessly fielded a ball hit to her and threw to first for the final out to give the Lady Vikings the 2016 State Softball Championship last spring. "The ball was hit to my left, no one was on and if it went past me it wouldn't have been the end of the world because I had faith in (pitcher) Cheyenne (Sowinski) and the rest of my team. So I went for it, got it on the short hop - I love doing running throws - so I just did it. The throw was right on and it was awesome." It was ironic that Divine made the play to end the game since she also missed a had hop to open the game on a similarly hit ball. "I tried to get past it because it would have grinded on me the rest of the game," she said of the first-inning error. West Coach Greg Klotz went over to talk to her after the inning and her answer didn't surprise him. "She came in and said 'I was back on my heels, I knew what I did,'" Klotz recalled. "That's why it was great that she got the last out of the game. She was not going to make the same mistake twice. She knew it and it was a little redemption for her." Divine finished with a single in three at bats, two putouts and three assists in the 2-1 title game win over Delavan-Darien. "The atmosphere was like what you see in the movies," Divine said. "I'm talking about it again and I'm getting goosebumps. My sister came back from college. My parents were there, grandparents. Every time I stepped on the field I just tried to take it all in because you never know whether you will get that again." Katey then talked about how everything fell into place last year. "It was something I've been working for a long time," she said about going to state. "It was something I knew we had a shot doing when I saw who the teams would be. Everything paid off, but it still unexplainable, indescribable. I get goose bumps talking about it honestly. It was once in a lifetime." 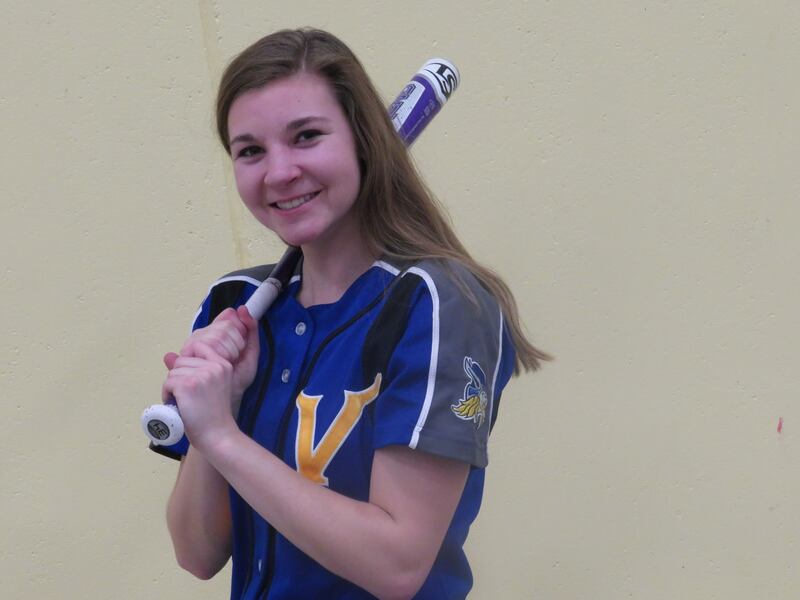 It's no secret that Sowinski and third baseman Cam Koltz are the most talented players on the Lady Vikings team, but Divine is the glue which holds this team together. "Obviously, we've been told we can't take anything for granted this year," Divine said. "We're 0-0 to start the year, last year means nothing. We have grown closer, we have a lot of returners and the chemistry's there. We know what we're capable of. We go into every game - not knowing that we'll win - but kind of expecting it because we've done well before." Klotz talked about Divine's key role with this team. "She knows the game. She has a good read with what's going on," he said. "She uses her smarts as much as her ability to put pressure on the other team. "She knows what the other team is trying to do. She is motivated to do well and she is more cerebral than most players. She gets it done. Other people might get it done, they might have had better players, but Katey wants - and gets - us to play together. Those are her leadership skills there." Divine talks about her major skills. "My communication," she said. "I try to talk to my pitcher between every pitch. I let everyone know to make sure we're on the same page. It's rare that I'm quiet during a game. "I also try to stay really positive and I try to keep my team like that. But I also have to stay level-headed and can't get too excited or things can slip away pretty fast. I think my positivity also is important as well." Klotz then talked about Divine's ability to lead - on and off the field. "She has the ability to get people to follow her," he said. "Her family is active in their church. She does so many things. She received a full ROTC scholarship to the University of Pittsburgh. The other day she read an email at open gym to the student-athletes on hand, saying how important school is." Divine had a good answer when asked about her leadership skills. "Maybe this is their (Mary, Jim her parents) bias - but they always told me I was a natural leader," Katey said. "So I've kind of been in that mentality since elementary school. I've taken on leadership positions in school in different clubs and in cross country I was a captain this year. "But I don't need that validation (captain title). I know I don't need the label because I know I can lead by example or by doing my thing. I definitely try to talk to all the players, whether I have a strong relationship with them or not. I try to keep them motivated if they're down or praise them when they're doing something great." Klotz first saw Katey play 10 years ago with the New Berlin Magic and ended up coaching with Tim Minik, who has been Klotz' varsity assistant. Minik and Klotz coached Katey and former West star Mallory Klotz for two years. "Katey was always the smartest, had the most game sense," Klotz said. "She pitched, played first base and was a team leader. I'd love to have her at first base now. "She doesn't have the strongest arm, but she charges the ball and does everything just right. She's a special player, a special kid. She is never down and she picks people up. She is one of my favorite kids to coach and I've coached 100s of girls." Devine ran for the Lady Vikings cross country team for four years, making it to state last fall. She started at shortstop her sophomore and junior seasons as West finished second and first. She made second-team all-conference the last two years. Katey's sister, Carey, played volleyball and softball at West and is attending Tulane University in New Orleans. Jamey, who played volleyball and ran track, is a sophomore at UW - Madison. Katey, whose first memories of softball went back to when she was 3 years old, playing whiffle ball in the backyard with her dad and sisters. 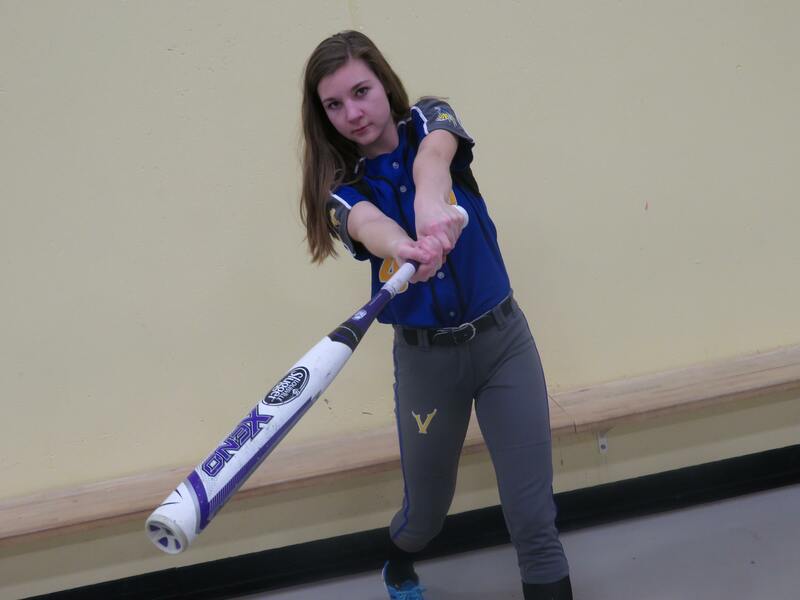 After getting involved with fastpitch, Katey was hooked. "I loved it. It was something I always enjoyed playing," Divine said of softball. "I always wanted to go out there and practice. There's been times I wanted to do track because I love running, but it was always softball. I couldn't give it up." Divine talked about her softball relationships. "We spend a lot of time together and we have to rely on each other on the field. It's one of the most heavily-involved team sports. You also just develop great relationships with them and obviously we all love it. We've been in it at least 8 years and we spend a lot of time together." Klotz talked about his relationship with Katey over the years. "She is still the same kid," he said. "She has a huge heart. She wants to be the best she can be. Academically she is solid. I've been proud to coach her." WHAT DO YOU DO TO RELAX? Lay in bed, listen to vinyls on her record player. MOST MEMORABLE SPORTS MOMENT: Getting the final out to win the State Softball Championship for New Berlin West last spring. WHAT WOULD YOU LIKE TO DO IN THE FUTURE? Attend the University of Pittsburgh, Major in International Studies. Accepted into Army ROTC program.